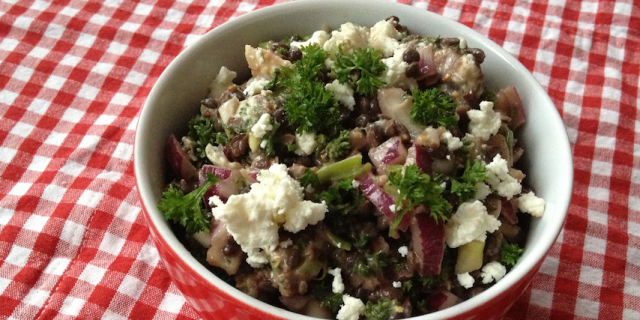 This Beluga Lentil Goat Cheese Salad is delicious in its simplicity. Over the years I have fallen in love with lentils. I love a good Dahl or lentil soup. There’s something heart-warming and nourishing about lentils. They are also great sources of protein, especially if you are on a vegetarian or vegan diet. I rarely eat cheese as I try to avoid dairy but when I do I make sure I enjoy it. You can enjoy this Beluga Lentil Goat Cheese Salad on its own as I often do or as a side-dish to a larger meal or salad. Rinse the lentils and cook for 45 minutes (unsoaked). Allow to cool down completely. In a large bowl combine the red onion, parsley and lentils. Mix the dressing ingredients in a glass container and sprinkle over the salad. Sprinkle fresh goat’s cheese on top.